Can this high-end Series 9 LED TV beat OLED? Looking back with rose-tinted spectacles is poor form, but when it's through a rose-tinted TV, that's fine by us. An absolute whopper at 75 inches, the Samsung Series 9 75ES9000 is an almost unforgivably proportioned Edge LED television that instantly sits atop Samsung's vast TV ranges. 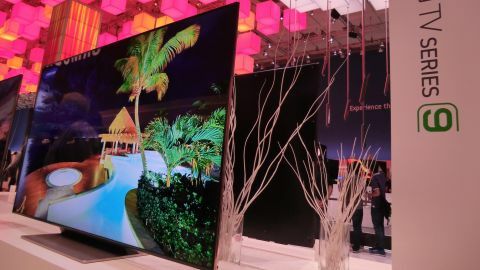 While Samsung and LG jostle for the prize of just how many trade shows in a row they can show off their new OLED TV without actually putting one on sale, the likes of this 75-inch TV are likely to slip slightly under the radar. However, with OLED imminent (we're staying positive), this uniquely coloured specimen could be the last hurrah for truly top-notch giant LED TVs. Ignoring the fact that Angry Birds can be played on it, the Samsung 75ES9000 instantly triumphs in the cool stakes. And it should do for the price: £7,999 in the UK (where it's known as the Samsung UE75ES9000), $9,999,99 in the US (Samsung US75ES9000) and to be confirmed in Australia (Samsung UA75ES9000). The really rather nice rose-gold coloured tint on the bezel is more gold than rose, in our opinion, though the way it curves around the bezel is genius. Measuring just 7.9 mm, there's no visible seams, either. A camera would badly interrupt the bezel's sleekness, but needs must in the world of Skype video calling from a TV (we did this once. It was weird) and gesture control (ditto); cue a cute pop-up camera that's otherwise completely invisible (excellent news). As well as enabling a motion controlled version of Angry Birds (we saw more than a few IFA 2012 delegates flailing about while trying to dive-bomb a smug pig), other smart features include voice control (using Samsung's previously seen trackpad remote with built-in microphone), smart TV apps (with dual-core processing for fast loading and multitasking) and 'smart evolution'. Like some Darwinian theory with a suit on, the latter involves inserting a chipset next spring to bring the Samsung 75ES9000 - which also sports active shutter 3D tech - up to speed with the latest Samsung technologies. A Samsung rep told us that this meant the set was guaranteed future-proof for four years, though the actual upgrade kit will cost a few quid. Picture-wise the Samsung 75ES9000 impresses on three counts. Firstly, it was the vibrancy of the colours that instantly struck us, with greens in particular appearing very natural. Then, the detail in a Full HD source. Lastly, the viewing angle is wide. As in, really wide. We viewed it from right at the cusp of invisibility, and the black levels and colour solidity still stood up. The first two of these pros is down to Micro Dimming Ultimate and Precision Black, technologies that become exponentially more important in bigger TV panels. Both were borne out during a sped-up sequence of the night sky's constellations spinning past an outcrop of the Grand Canyon. Still, having gawped at Samsung's 55-inch OLED TV just yards away, the detail isn't nearly as crisp - we spotted some jagged edges - nor the motion as smooth. It's an unfair comparison, though, since Samsung's OLED still doesn't have an on-sale date, but there you go. At least the quality of black held out. We didn't get a chance to test the Samsung 75ES9000's sound at IFA 2012 - unfortunate since the speakers are a reputable 15W. But we know that this TV uses SoundShare; all audio can be sent via Bluetooth to one of Samsung's Series 6 and Series 7 wireless docks. Samsung also used IFA to announce the launch of the 65-inch 65ES8000, which also includes Micro Dimming Ultimate. But in terms of size and styling, the Samsung 75ES9000 is totally unique.